Recycle All Of the Things! Yeah, I love it! Simple, yet classy. Thanks for loving the blog – we love the readers right back! My kids graduated in 2010 and 2012. I just saw this on Pinterest and thought “why not” and they LOVED them. Go for it! I think you could find tassels in their colors and put them in ornament balls. Maybe if you check ebay or something you could find the year. Could make them into Christmas ornaments. That is what I am going to use mine for. Not that mine is a graduation, I just found some on ebay that I could buy just one with free shipping in the color to match my theme. What size ornament is used for this? I’m worried I’ll get one with an opening too small for the number charm to fit. Some craft stores have empty ornaments that are made with wider openings for these crafty purposes. If I were you, I’d take the tassel (which also come in different sizes) with you to the craft store to make sure it’s going to fit. Ornament pictured is about 3 inch diameter, I’d guess. My number was a little to big. I just cut one side of the opening a little wider and glued the clasp back. I put a little ribbon around it and looked great. thanks for the idea. 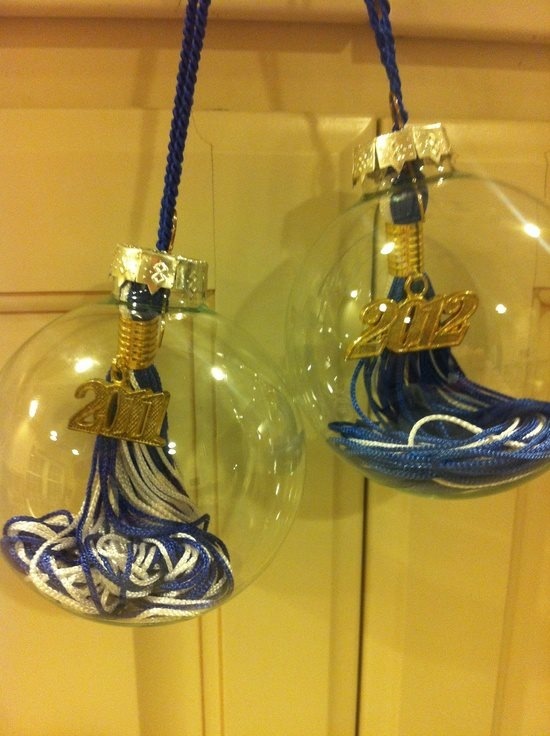 This is such a cute idea, but how did you get the tassel threaded through the top of the metal ornament cover? All the ones I have seen have solid tops. Thanks! Where did YOU get the ornaments? I can’t find them with a big enough hole!!! I saw the ornaments at Michael’s craft store in the St. Louis area- months ago though. They have them out at Christmas in most craft store, but Hobby Lobby carries them year around. Found the ornaments at Hobby Lobby, I used the clear plastic for the first ones. Couldn’t find the ornaments with the gold trim so I took a gold paint pen ant pained the cap to match the year on the tassels. I took a pair of ex. small scissors and cut between the little holes that hold the hanger. Took about 5 minutes to do two of them. I want some blue ones, or aqua or turquoise and all I can find is black or white. I am using glass bulb, but cant get the year through the opening because it is so close to the end of tassel, any suggestions? You might be able to bend the year?? Or use plastic bulb? Sorry I don’t have a better way. I see I commented earlier, but I made one and did my ocean theme, thought maybe I posted it on pinterest, but guess I didn’t. Pingback: 21 Christmas Keepsakes for Kids! These are so cute !!! Great idea !!! What did you hang them on ?